Bangladesh Petroleum Exploration and Production Co Ltd (Bapex), the only national company engaged in exploration and production of gas within the country, has been given its due priority after decades of neglect. Officials of Bapex talk about Bapex's capabilities and prospect in the face of Bangladesh's increasing energy crisis. The search for natural fuel to quench civilisation's energy needs continues to be a costly gamble bestowing despotic powers to nations and corporate bodies and often leading to social, political and economic conflicts. Lack of capital and technology makes the ownership of natural resources a burden for most poor, developing nations that hardly get the benefits of their own resources. Consequently, developing countries have to depend heavily on foreign help in the form of technological, financial and advocacy support and in that pursuit building their own internal capacity often remains neglected. While private companies in poor nations lack the funds to carry out capital-intensive explorations, corruption, inefficiency and bureaucratic red tape in national organisations are frequently cited as the reasons for the government's reliance on foreign companies. Amongst all these allegations, Bangladesh Petroleum Exploration and Production Co Ltd (Bapex) is proving to be an exception. Formed in 1989, out of the Exploration Directorate of Petrobangla (Bangladesh Oil Gas and Mineral Corporation), Bapex remained fund starved till February 2000 as its source of revenue to meet capital expenditure and expenditure for exploration and drilling and infrastructure development remained uncertain. It was not even given any producing gas fields that could have ensured its income and development. The company's operational expenditure was met from the margin imposed on the gas sale proceeds of the gas distribution companies of Petrobangla, against the assets and past discoveries of Bapex. "The fund required for exploration comes from government. Bapex does not own any fund with which they can carry out exploration. In 2000, Bapex was transformed into an exploration and production company. However, even then we did not have enough works in our hand and most of our best human resources – geologist, drilling experts, engineers and chemists – left either for foreign countries or other multinationals for better pay," says Mortuza Ahmad Faruque, ex-managing director of Bapex. Initially, when Bapex started production, it received a tariff of only Tk 7 per thousand cubic metres, the rate offered to national gas production companies in contrast to about three US dollars (approximately Tk 200) offered to foreign companies. This was not enough to meet the company's operational cost let alone its exploration activities. At that time, Bapex was rather viewed as a burden since government had to spend around Tk 30 crore for its overhead and administration purpose annually. Bapex now has the capability to compete with foreign companies in carrying out 3D seismic surveys. Photo: courtesy. It was the caretaker government that took the first step towards reviving the company and in the fiscal budget of 2008 pledged Tk 3200 crore fund over a period of seven years, and from July 2008, following a proposal from Bapex, the gas tariff was increased to Tk 25 per mcf (1000 cubic metres). At present, Bapex is producing and supplying gas to the national grid from its two gas fields Fenchuganj and Saldanadi, which have been discovered by Bapex in the 80s and late 90s respectively. The acting Managing Director of Bapex, Md Amzad Hossain says: "The financial capability of Bapex is better than before. The Shahbazpur, Bhola gas field that we had explored in 1995, has gone into production and is supplying gas to a power plant since May 2009. We are also producing gas at a well in Fenchuganj. We have also made financial gains of a few hundred crore taka by drilling and carrying out workover (repairing job and reactivating old wells) in more than 14 wells between 2006-10, which otherwise would have gone to foreign companies. Still our earnings can only cover our administrative costs like salary but for exploration and development cost we still rely on government funds." In reply to whether Bapex has the technical capability and expertise to compete with foreign companies, Hossain asserts: "We definitely have the capability to compete with foreign companies in carrying out 2D and 3D seismic survey. We also have competitive equipment and manpower needed to carry out onshore exploration." He adds that at present Bapex owns four rigs (apparatus used for drilling oil and gas wells), three drilling rigs and one workover rig, while two more are in the process of acquisition. 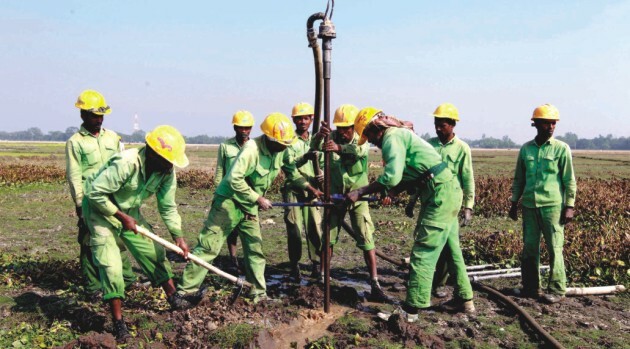 Hossain, who is also the general manager, drilling, says, "Our performance is better than foreign companies in the sense that our men are better suited to the climatic conditions of our country. Before drilling the well, a number of holes have to be dug in the field for about 100 to 400 kilometres. Most of the time, these works are carried out in muddy fields, which hamper the progress of work for foreign companies because their field workers are not as suited to our climatic conditions as our men." Faruque provides a picture of the exploration and discovery saying that when past governments entered the PSC with the foreign companies, they had expected high success rate. However that expectation was not met. "In the last 12 years, from 1998- 2010, drilling by foreign oil companies has resulted into only one discovery – the one by Tullow. Its Bangora gas field produces only 310 bcf of gas out of national demand of 700 bcf per year. That is their discovery which cannot even satisfy the gas demand for six months. In the offshore, 18 exploration wells have been built but only one commercial discovery has been made that is Sangu. There is one at Kutubdia but that is not commercial." In comparison, Bapex's success record is better with 10 discoveries out of 21 drillings. However Faruque reminds that field reserve of national companies are far less than that of foreign companies: only eight percent compared to 92 percent belonging to the foreign companies. In spite of its success rate in discovering gas fields, Faruque thinks that Bapex is yet not ready to take up all the exploration activities required to meet the present supply-demand gap of Bangladesh. "We do not have the technical capability, expertise and experience to work in offshore. There are other limitations for example Chittagong Hill Tracts has complicated structures and the geological complexities of the area will take a long time to work at. In addition, we need deep drilling rig. At present the total production of the country is 2000 mmcf per day out of which Bapex only produce 40 mmcf which is two percent of the total production. Bapex cannot take the entire load of production overnight," he says. Faruque further adds: "Risk, investment and technology involved in offshore exploration are very high. A poor country like Bangladesh cannot possibly afford to take the risk involved in offshore drilling where only one commercial discovery has been made out of 17 drillings resulting in millions of sunken money. Foreign oil companies can afford such expeditions because they share the cost regionally. If they do not discover a well in Bangladesh they may discover one either in Myanmar, Philippines or Thailand and then share the regional cost accordingly. It is not possible for a national company to do so." Bapex in the last few years has undoubtedly proven its capability but it also has problems that need to be addressed. One of its biggest challenges is retaining highly educated and technically proficient workforce. A raise in the pay scale is a justified demand of Bapex, if it wants to compete with foreign companies plus it needs to lessen bureaucratic intervention in buying its equipment and disposing off its decades-old rigs. With its international standard survey techniques Bapex has recently discovered a potentially large oil and gas structure in Netrokona and Sunamganj districts (shortly named as Sunetra) with an estimated reserve of two -three trillion cubic feet reserve. If the smooth injection of fund is continued, this company in the long-run cannot only become profitable but also help reduce the strain on Bangladesh's foreign exchange reserve that results out of the payments made to foreign oil exploration and production companies.